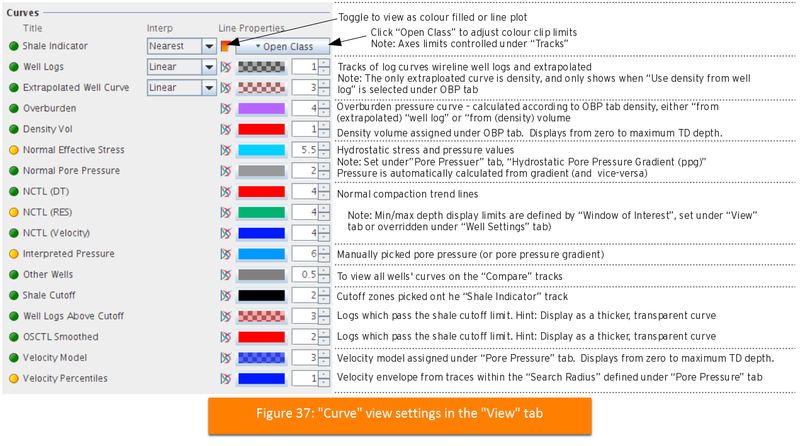 The 1D well calibration (Pore Pressure Prediction view) offers detailed controls on the track and curve views. Most of these can be set from either the View tab, or by right clicking one of the display tracks, and choosing Configure Track. All generated curves can be exported to LAS file format. The View menu is the global setting. Both may be overridden on a per-well basis in the Well tab. Annotations - Toggle the visibility of well markers (tops). Grid lines - Colour and thickness. Note: Zero thickness is a very thin line, but not invisible. The number (density) of grid lines is controlled in the track configuration dialog. Units - Units for Pressure Gradient track (ppg or SG). Figure 35 describes all the common view settings. switch on and off the property tracks by toggling the yellow/green buttons. set track clip limits. Use checkbox to auto-clip to visible data. set the panel width in pixels. A zero value (0) will autofit. set line colour, transparency, and width. 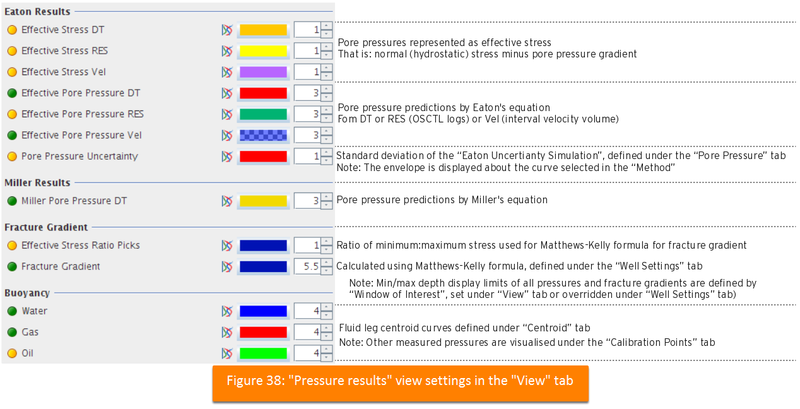 Buoyancy - Shows the pressures for each set of fluid columns set in the Centroid tab. Note: Other measured pressures are viewed under Calibration Points.